Political show. On September 10, former head of Odesa region and ex-president of Georgia Mikheil Saakashvili crossed into Ukraine without required documents. Earlier on that day, he tried to cross the border on board of the train Przemysl-Kyiv (from Poland), however the Ukrainian railway company Ukrzaliznytsia stopped the train. 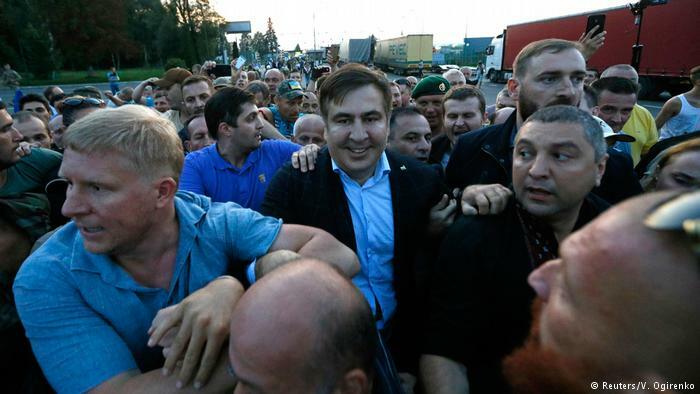 Saakashvili approached the border on the bus. Following long negotiations, the crowd literary brought him into the Ukrainian side. He was escorted by Ukrainian MPs among whom was Yuliya Tymoshenko. Saakashvili said he would be asking for an ID of a stateless person that would make it obligatory for the Ukrainian side to let him in. However, the politician’s supporters speeded up the process by breaking through the border. Later Saakashvili said that he was heading to Lviv, where he would decide on what to do next. It all started on July 26, when President Petro Poroshenko stripped Saakashvili off the Ukrainian citizenship with a decree. The formal pretext for the action became the fact that Saakashvili allegedly had not presented the information on the criminal proceeding opened against him in Georgia. The Ministry of Justice of Georgia hopes that Ukraine will extradite Saakashvili after he is back in the country. The Ministry of Justice of Ukraine confirmed it had received the request from the partner agency in Georgia regarding the extradition of Saakashvili. Law enforcement response. Ukraine’s Prosecutor General Yuriy Lutsenko said that those responsible for the illegal crossing of the border during which Saakashvili got into Ukraine will be held criminally liable. The State Border Guard Service reported that several border guards and policemen were injured during the breakthrough. The Ministry of Interior elaborated that 12 policemen and five border guards were injured. Minister of Interior Arsen Avakov said that Mikheil Saakashvili has to complete the border control procedures either at the Shehyni border crossing point or at the office of the Migration Service. Public reaction. The return of the politician became a scandal. Politicians, opinion leaders, journalists and experts were discussing the event all day long. Many of them condemned Saakashvili’s actions – with his voluntaristic gesture the politician undermined the idea of the state border. He thus demonstrated that a group of unarmed persons may cross the border without any obstacles. It is not that much important whether the border in question is in the east or in the west. Prime Minister Volodymyr Groysman called it “an attack against the Ukrainian statehood”, President’s Envoy on the peaceful settlement of the conflict in Donetsk and Luhansk regions Iryna Herashchenko called it “humiliation of the country”. However, many pointed to the fact that Saakashvili’s actions come as a response to how Saakashvili was deprived of the citizenship in a voluntaristic and politically motivated way by President Poroshenko. Moreover, many of the actions that the Ukrainian authorities took to on September 10 violate the Ukrainian legislation including the illegal train stop with Saakashvili on board, closing the border due to the alleged “mining” of the border crossing point etc. The situation now extends beyond legality and has reached political standoff that generally does not contribute to the benefit of Ukrainian society.